Our Thanksgiving food drive benefiting Sheridan House was a great success. 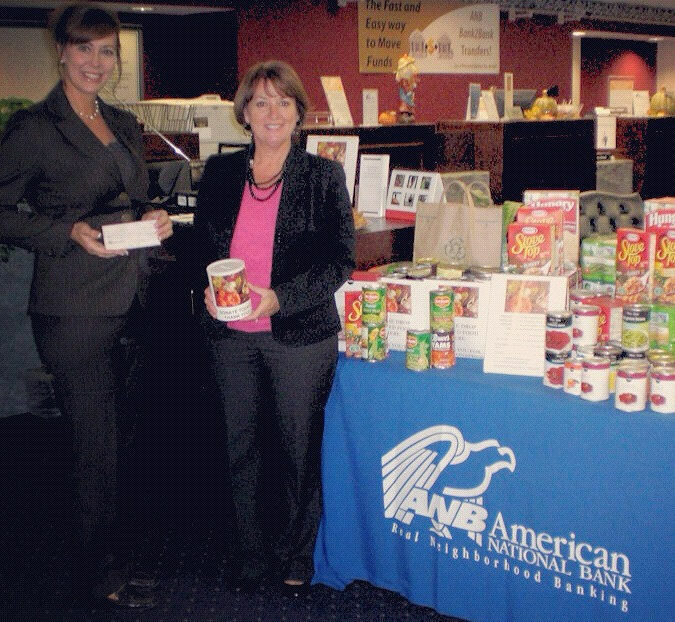 Amy Engelberg, EVP/Chief Lending Officer and Angie Sherlock, SVP/Chief Compliance Officer presented the food items and cash that was generously donated by ANB clients and employees to Sheridan House on Friday, November 9th. The ANB team is proud to support Sheridan House, which provides much-needed support to single moms who are doing their best to raise their children on limited income and without the support of a father figure in the house. Amy Engelberg, EVP/Chief Lending Officer and Angie Sherlock, SVP/Chief Compliance Officer stand next to the food items generously donated during our Thanksgiving Food Drive benefiting Sheridan House. This entry was posted on Wednesday, November 14th, 2012 at 3:19 pm and is filed under Uncategorized. You can follow any responses to this entry through the RSS 2.0 feed. You can leave a response, or trackback from your own site.